Decorative columns continue to be used around the world on all types of buildings because of their elegance and beauty not to mention their imposing feel. They can change an ordinary building and turn it into something extraordinary. While decorative columns have been used since the time of the Ancient Egyptians, the Greeks, and the Romans, the columns were typically made of solid stone so they were heavy and very challenging to install. Many have since crumbled over time due to exposure to the elements. To solve these issues associated with traditional decorative columns, architectural fiberglass was introduced. Architectural fiberglass is made from high-quality alpha gypsum that is reinforced with glass fiber and polymers. The versatile material can be used to create any type of decorative column among the various orders, including Tuscan, Doric, Ionic, Corinthian and Composite architectural columns. Besides its design flexibility, including the ability to mold it into an array of shapes and textures, architectural fiberglass columns are lightweight as well as water and weather resistant. This means less maintenance and a longer life for these types of columns, providing significant value to anyone considering using architectural fiberglass for their column designs. • The Stromberg team has extensive architectural knowledge about all types of architectural orders and how to design decorative columns that meet the features of each order. • The decorative columns are created in accordance with the highest quality and craftsman standards possible. The architectural fiberglass used for the decorative columns and column covers has been tested at independent laboratories and found to meet or exceed the strictest fire and building codes for strength, non-combustibility, and flame spread. 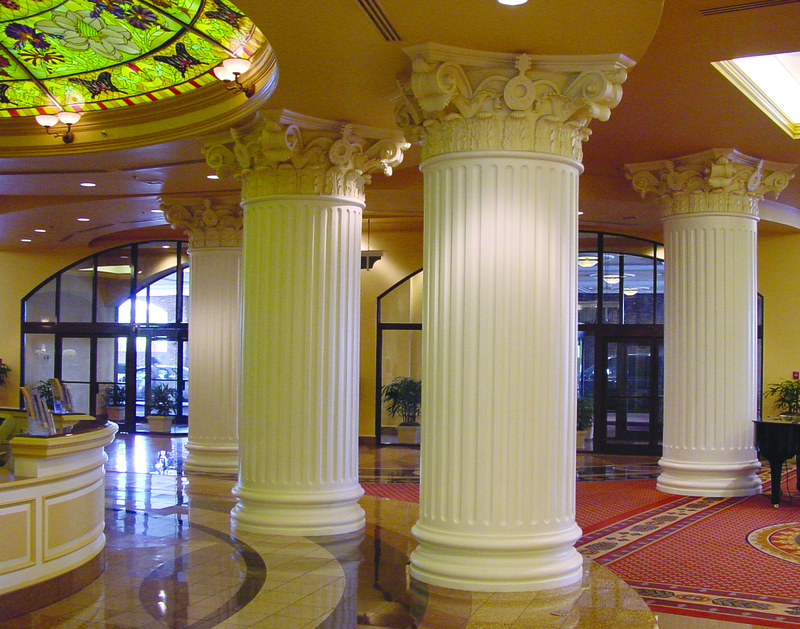 • Stromberg’s decorative columns are featured at well-known resorts like Atlantis in the Bahamas, at amusement parks like Universal Studios in Orlando, and at restaurants like The Cheesecake Factory. The company has been creating decorative columns for clients for over 30 years. • Stromberg’s architectural fiberglass columns are custom made to your specifications, including size, color, texture, design, style and finish. Custom bases and capitals are also available. • Direct ordering and shipping save considerable money. 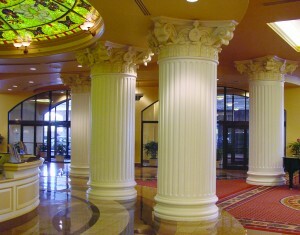 • No other company offers faster turnaround times for decorative columns. • Installation is easy, using only joint compound or drywall adhesive with drywall screws. • Stromberg has an excellent reputation with its customers in terms of their satisfaction. In fact, over 81% of the company’s business is from repeat customers. These advantages make Stromberg the perfect partner for restoration projects that require decorative columns for interior and exterior applications. The Stromberg Architectural Products team has custom designed and manufactured thousands of decorative fiberglass columns for universities and colleges, commercial buildings, resorts and hotels, casinos and courthouses all over the world. Get your free custom quote by calling 903-454-0904 or filling out the online form.